excel version of your entry is highly preferred as it auto feeds the master template and reduces keying errors and speeds up consolidation so no pdfs or manual sheets please. Last edited by Chris Cook5; 12-11-2017 at 11:16 PM. Yes, if you download Excel for Mac it should work exactly as it’s supposed to. I used Excel on a Mac all through college (as a finance major I used Excel quite a bit) and never had a problem. Well, the question is will it work with the Apple app Numbers on an iOS device. It would be impossible for anyone else to answer without seeing the actual spreadsheet, but the compatibility that Numbers promises is for the ability to open Excel format spreadsheets and save to them, but not support every single feature. I would think that the best way to proceed is to use Excel only, and probably on a Mac or Windows PC only. 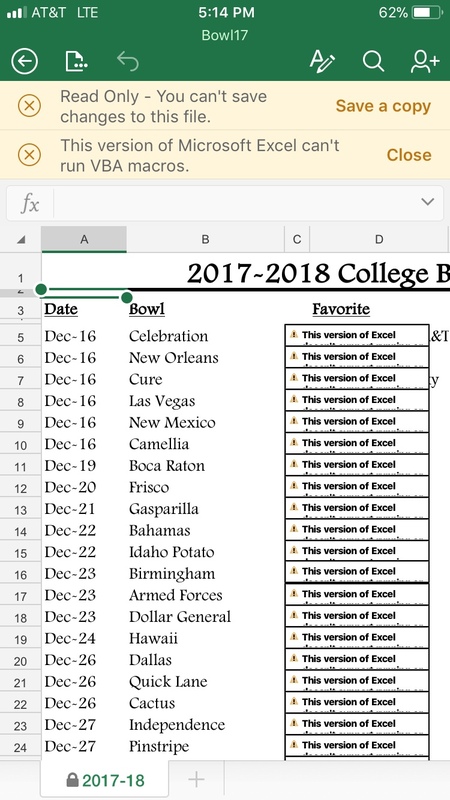 Don't you need a subscription to Office 365 to edit / save spreadsheets, which I presume this college picking spreadsheet requires, with the Excel app? I read this question as I have an iPhone, the Numbers app is free, can I use it to edit a spreadsheet, etc. Oh, good point. I didn’t think of that. Thanks for the info. That's what I figured was going on. Numbers also does not support VBA macros, on the Mac either. You will need a Mac/PC version of Excel for this: iOS app guidelines would not allow Microsoft to add support for VBA macros in Excel spreadsheets on an iPhone or iPad. IPhone X clear case with port covers. Missed Hour of Code? Learn to program with these helpful guides!